You are here: Home>Places>North Kensington>Come and Help us, Lads, Quick! 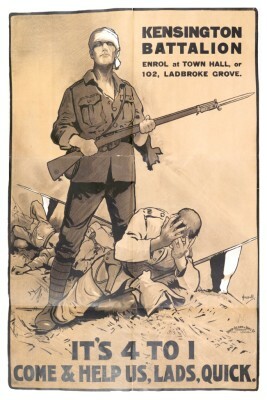 This striking poster was used as a recruitment tool to encourage local men to join the Kensington battalion, 22nd, which had been raised by the Mayor of Kensington, William Davison. It is the only poster Davison included in his scrapbooks. It was painted by the artist John Hassall (1868-1948) who lived in Kensington Park Road and who in 1900 had opened the New Art School and School of Poster Design also in Kensington. The school closed at the start of the war and afterwards Hassall started a correspondence school. He is best known for two works; “Skegness is so bracing” (1908) featuring the famous Jolly Fisherman character and the Kodak Girl (1910) used by the Kodak company for many years. The recruitment poster may have been commissioned by Davison himself. According to a history of the Kensingtons by Major Christopher Stone Lord Kitchener was shown this poster and admired it except that the breeches of the fallen Uhlans were too smart. “No Uhlan ever had decently cut breeches.” Hassall inserted several deep creases in the breeches to win Kitchener’s approval. Hassall’s son Christopher was a poet and his daughter Joan was also an illustrator. His grand daughter was the actress Imogen Hassell who appeared in Hammer films and in several 70s TV shows.